The fortunes of Christianity have waxed and waned in Britain. Early in church history, so many Celts converted to Christ that the island could be called a Christian country. One of its sons, Patrick, carried the gospel to Ireland where Christianity also triumphed. However, the Celts fell to an invasion by Angles, Saxons and Jutes in the fifth century. The Anglo-Saxons were pagans, worshipping the Norse gods, whose pantheon was headed by Odin. Celtic Christians, hating the invaders who had robbed them of their land, made little or no effort to convert them to Christ. In the sixth century, Irish monks crossing from Ireland, began the conversion of pagan England from the north. In the seventh century Augustine of Canterbury brought the gospel to Kent, in the south. Ethelbert ruled Kent then. He worshipped Odin, the god of his fathers, but allowed his wife, Bertha, to practice Christianity. She was the daughter of a Christianized French king. Perhaps her influence explains why Ethelbert was gracious to Augustine when he came, declaring that he brought news of an eternal kingdom. According to the eighth-century Anglo-Saxon historian Bede, Ethelbert agreed to meet Augustine and hear what he had to say. The meeting had to be in the open, however. The king believed that Augustine's "magic" could only work on him inside a building. In spite of his precautions, Ethelbert was eventually converted with thousands of his followers, although he did not compel any of them to become Christians. The king built several church buildings and gave Augustine the ground at Canterbury where the cathedral now stands. It has always been the primary see of England. 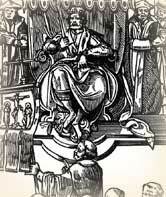 Although Ethelbert's most important act was to accept the Christian faith, he is notable for promulgating the first English code of law and for bringing most of Anglo-Saxon England under his rather loose authority. On February 24, 616 the king died. Because that is the feast of St. Matthias, Ethelbert is commemorated not on his death day, but on the following day, February 25. "Augustine, St., of Canterbury," and "Ethelbert, St." The Oxford Dictionary of the Christian Church. Edited by F. L. Cross and E. A. Livingstone. Oxford, 1997. Howorth, Henry Hoyle. Saint Augustine of Canterbury. London : J. Murrary, 1913. McKilliam, A. E. Chronicle of the Archbishops of Canterbury. London: James Clarke, 1913. "St. Augustine of Canterbury," and "St. Ethelbert." The Catholic Encyclopedia. New York: Robert Appleton, 1914.